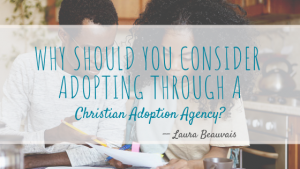 Why Should You Consider Adopting Through A Christian Adoption Agency? You may ask yourself, “Is adopting a child through a Christian agency all that important?” After all, there are many ethical and competent agencies that provide excellent services but do not reference being Christian. Here at Nightlight, we are a distinctly Christian agency, and as a result, you may decide to adopt your child through us. 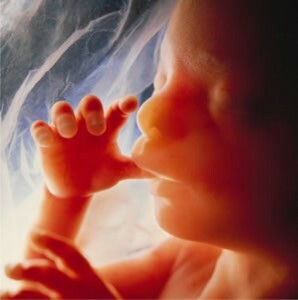 Nightlight believes in the dignity of human life. This is more than just a belief system in which we are “pro-life.” We advocate for life being given to all humans, starting with embryos—even embryos who may be considered “special needs.” In our Snowflakes program, Nightlight staff provide extensive services to both the genetic/donor and the adoptive families. We are committed to these embryos being born into loving families who have a positive view of adoption. Because of our dignity for all human life, we value the birth families making an adoption decision. This translates into our advocating for openness in adoption so that birth parents and the adopted children can have continued relationships. We always want a woman’s choice to place a child for adoption to be a positive and life-affirming decision; therefore, we care well for expectant women. If instead of adoption they decide to parent, we give dignity to that decision as well. Women who are expecting children with profound special needs are also supported, and Nightlight has been able to place any newborn infant, regardless of the seriousness of the child’s needs, into a loving family. Nightlight staff care for the orphan, as mandated in Scripture. At any one time, Nightlight offers close to 15 different international programs. We believe children need to grow up in families and not in institutions. We at Nightlight are committed to placing foster children into stable families. We believe Christian families should be supported and not be deterred from fostering and adopting children who have experienced abuse and neglect. Our approach is refreshingly different in the attention our families receive. Nightlight is pro-family. We believe children grow up best in a family environment with a mother and father who have made a life-time commitment to each other through marriage. While we do allow children to be adopted into single family households, we all agree nearly all children do best being reared by a couple. When families come to us to conduct their home study and adoption, these pro-family values are represented in the way we support our clients. We value adoptions. This may be obvious, but not all adoption programs are financially prudent. Nightlight’s battle cry is “Get more kids adopted”; therefore, we offer nearly every type of adoption possible and do not choose to offer programs solely based on the economic success of a program. Adoption is part of God’s plan. All believers are adopted by God as one of His children and so we view adoption as a positive experience. As with our spiritual adoptions into God’s family, earthly adoptions also come as a result of loss and grief. We know the struggle is real and adopted children can face many issues. We offer continual support and counseling to families—not just during the adoption process but after placement through our Post Adoption Connection Center. Nightlight staff will be praying for you and your child. Each week, the staff at Nightlight pray for the needs of our birth families, adoptive families, waiting children, and our agency. We believe God loves our families and waiting children even more than we ever could and so we bring them before his throne often! Nightlight staff and board members adhere to set of Christian and ethical principles. While many people who do not claim to be Christians observe these high ethical standards, we at Nightlight have a reason for our ethical standards: we are commanded to adhere to these morals. Our standards are not simply obedience to rules, but obedience to a God whom we love. Therefore, we will be honest, hard-working, diligent, giving, and caring because God gives us a special love for those placing children, “orphans,” and for those adopting these children. We believe that being a Christian is a result of the transformative work of Christ in our lives. Most importantly, those at Nightlight believe Christianity is more than an ideology through which we provide services. Our goal is that children’s lives will be transformed by a relationship with Christ in the context of a loving family. So how does God’s transformative work in us at Nightlight make a difference in the way we provide services to our families? First, we believe God is sovereign, and He knows the child for you. Your child may or may not be through Nightlight. Next, we seek to be directed by the Holy Spirit, so the decisions we make are often the result of prayer. We are not perfect. Our goal is to be wise and provide godly counsel and support to you and your family. Such counsel and support begins when you first make a decision to adopt and go through the adoption process and continues long after you are home with your child. If you have determined that Nightlight is the right agency for you, then we are honored to serve you and your child! As we approach a New Year, thoughts and conversations around resolutions are inevitable. Whether we resolve to go to the gym more, worry less or finally plant that garden, most of us face January 1st with motivation and resolve to conquer the impossible. And most of us know that by March (if we’re lucky) that motivation has been drained and life has somehow gotten in the way of bringing the full resolution into reality. So why does that happen year after year? I would argue we each get in the way of ourselves. 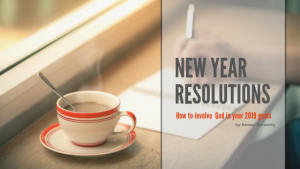 Never did I involve God in my resolution until a few years ago. I decided my resolution would simply be: Less of me, more of Him. It was the hardest resolution I have ever made, but certainly the most effective, educational and life changing. First I had to figure out where, when, and how this resolution would take place. Every day, all day? What would that look like? Did I need to become Mother Theresa? Then I remembered 1 Thessalonians 5:17: Pray without ceasing. To me that verse means including Him in all things, big or small, all day long. So I did my best to start with that. With that in mind and habit, I allowed God to form HIS resolutions in me. It became less about what I wanted to change, but more about discovering what He wanted to change within me, around me and for me. The burden of a new resolution became less about goals and more about BEING who my Father wanted me to be. In this New Year, we challenge you to simply press in to the relationship you have with your heavenly Father. We know from 2 Corinthians 5:17 Therefore, if anyone is in Christ, the new creation has come; The old has gone, the new is here! It is truly a miracle that we have opportunity to renew ourselves by simply stepping into a relationship with Christ – either for the first time or deeper into the on we have. No membership fees, no diets, no degrees required. Happy New Year to all of our Nightlight families and extended community! May 2019 bring you abundant blessings and joy to all. It was Good Friday two years ago that we landed on U.S. soil completing the adoption of our first child. 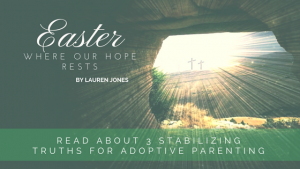 We had endured a long and grueling wait to bring him home, and we were met with a joyous celebration that Easter weekend as friends and family welcomed us home. Since then, we settled in as a family of three, hosted an older child over the winter holidays, adopted that child, moved cities, and then began settling in as a family of four. That Good Friday marked the beginning of a journey into parenthood for me that will forever shape and change the way I see Jesus and the celebration of Easter. In parenting, there is sacrifice. You learn to meet another human’s needs, and many times, you find that those are not convenient, easy, or desirable for you. Lately, I have begun to realize we have taken on a role that will ask more of me than I ever thought I could give. A role that will change and evolve over time in such a way that it is impossible to plan for what the next season will bring. In our case, it has begun to sink in that we have invited our children’s hearts, including all their wounds, into our previously peaceful home, and our children have begun to let us enter into a journey with them that feels often like a war. We battle for their trust, we battle for their health, we battle for healing in their brains, and ultimately, we battle for their hearts and souls. We battle against our own selfishness, we battle against the temptation to disconnect for self-protection, we battle to trust that God will sustain us in this calling, and we battle to choose love and grace in the face of rejection and defiance. When we stop to rest, we sit with our thoughts and feelings and realize we have battle wounds, and we trust that our God can heal those too. We trust He can heal our family’s wounds because He has gone before us in sacrifice. For our sake, Jesus chose to trade all that was good to become that which is void of good. Unlike humans, He is omniscient and all-knowing (Isaiah 46:9-10; Romans 11:33), so He knew fully and entirely the cost and pain of what He was choosing. There was no ignorance in His choice. He chose to love by sacrificing Himself, so that we could have His righteousness. He chose to pour out His blood, so that we might be saved from the wrath of God (Romans 5:9). So when my battle wounds are a result of my own sin, He chooses to bandage and cover them in His love instead of letting me anguish in the full consequence of death that they deserve. His sacrifice has afforded my healing. Power is a theme in my home. Who is the boss? Who has authority? Can this authority be trusted? It often feels as if it is not just my children and myself present in this struggle, but an invisible third party from their pasts, named Trauma, vying for power and authority. Thankfully, the One that has power and authority over trauma is trustworthy. He has power over the emotions that often roll like tidal waves within me as I parent, and He can be trusted to calm the chaos in my own heart and ultimately my home. In some mysterious way, His power is made perfect in my weakness (2 Corinthians 12:9), and what a relief that is in the days when I feel so weak! Jesus does not just have power over trauma and sin, but even over death itself. He showed this when He rose from the dead. If His is the power that can raise the dead, then His is the power I need each day. Power to restore me when I am weary, and power to forgive me when I fail. Even when my authority cannot be trusted, His always can. I am learning over and over that what my children need most is not for me to use my power perfectly, but to share with them about the Parent who always uses His power perfectly. It is not just that Jesus has power over death, but that He offers the hope of resurrection to all those who believe (1 Corinthians 15:20-22). He offers hope for this life and eternal life. He asks us to recognize Him as Savior and King, and when we do, He invites us into His presence immediately and forever. So there is incredible hope that Christ can one day make my children new creations. Because my husband and I believe that we need Jesus’ life, death, and resurrection, there is hope that He now lives in us, and is working in us for His will and good pleasure (Galatians 2:20, Philippians 2:13). He is redeeming people throughout the world, and He is teaching us how to love like He loves. Our hope rests in Him and what He has done. Our hope rests in the only One who can sustain us through the valleys through which He sovereignly leads us. Our hope rests in the permanence of His blood to triumph over all that is broken, including death. 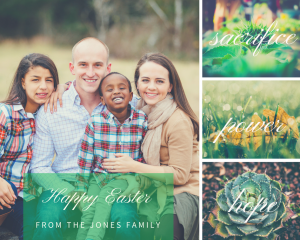 Easter is a joyous celebration of His incredible, redemptive, and perfect love in which all of our hope can rest. If you are a pastor or a layperson in North or South Carolina starting or involved in an orphan ministry, we want to provide you with tools and resources to assist you. 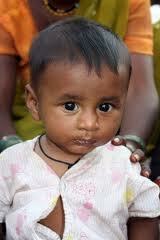 It takes more than a commitment to follow the mandate to care for the fatherless. Prayer, fellowship, awareness of the need and tools to meet the need are all essential. Let us encourage you in the work and give concrete steps to help you further your church’s ministry. Time: 11:45 a.m. to 1:00 p.m.
We hope you will join us as our guest for this informational luncheon. Included at the luncheon will be many resources along with a copy of Dan Cruver’s new book Reclaiming Adoption. 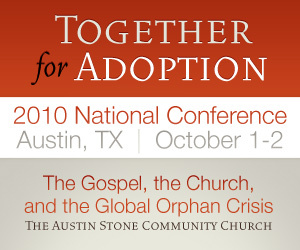 2010 Together for Adoption Conference: We’ll be there, will you? Nightlight Christian Adoptions is one of the exhibitors at the conference, and Laura Beauvais-Godwin, director of our SC office, is one of the breakout-session presenters. Are abortion and adoption incompatible? When I started working for Carolina Hope a few years ago, I discovered something that surprised me: many adoption professionals are pro-abortion-rights (not at Carolina Hope, mind you). But are they REALLY brothers? In the video post that Dan just put up, theologian and adoptive dad Russell Moore relates some theological insights from the questions he was asked when he and his wife adopted from Russia. I’ve transcribed (quickly and roughly) a portion below, but I encourage you to watch the entire 3-minute video. [When my wife and I began the process of adopting,] I found myself answering questions that really irritated me deeply. We had gone on our first trip to Russia and returned back and we had pictures, and we were showing people pictures of our boys.